From the 18 to 19 January the organisers of Intermat held a ‘Pre Intermat’ press event. This enabled show exhibitors to share new product information concerning developments to be released at the show in April. At the same event, an award ceremony was held for the Intermat award winners. About 80 exhibitors attended the press event, which was visited by representatives from over 100 trade publications from all over the world. On the evening of the first press day, a dinner was organised at Maison de la Mutalité, with the Intermat Innovations Awards Ceremony preceding the dinner. 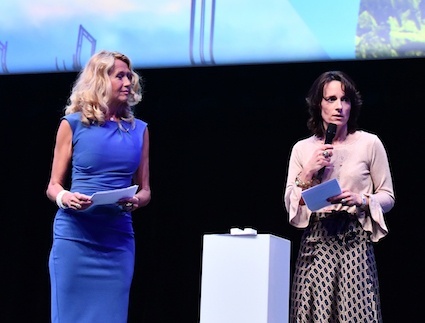 The well-known Belgium presenter Anne de Baetzelier hosted the awards and the dinner, with Intermat director Isabelle Alfano introducing the evening’s events. Digital Transition – Awarded to EFA France for the first embedded voice control system with integrated database communication. Energy Transition - Presented to Mecalac and its Mecalac e12, the world’s first compact wheeled excavator running solely on electricity. Start-up by Eurovia – Given to Matos for its Matos Connect paperless solution for operated equipment rental companies in the public works field. World of Concrete Europe Award - Sika France received the award for its 3D concrete printing process which combines robotic innovation applied to the concrete industry. Safety - Spanish manufacturer SIMA received the award for its HandSafe wood cutting saw which features a unique and exclusive safety system to instantaneously stop the blade the second that it touches human skin. As well as the aforementioned, the 2018 Intermat Innovation Awards were presented. These recognise innovation in construction equipment, machinery and processes used in construction and materials production. The 2018 awards highlighted several powerful market trends such as digitalisation, BIM and robotics, environmental solutions and the increasing importance of health, safety and risk prevention. The judging panel chaired by Bruno Cavagné, the chairman of the French Public Works Federation, comprised of 13 international experts representing users of the construction machinery which will be exhibited at Intermat 2018, and representatives from the public works, civil engineering, roads, buildings, equipment rental and concrete industries. Eight winners were presented with their awards in four categories, with this reflecting the new organisation of the exhibition into four hubs of expertise. Earthmoving & Demolition - Volvo CE and its EX2 model received the Equipment and Machinery Award. The Components and Accessories Award was given to the DMIC UBIWAN®SMART for its connected management solution for construction machinery and equipment. Roads, Minerals & Foundations -The Equipment and Machinery Award was presented to the FAYAT TRX 100%, which is a mobile hot mix asphalt plant capable of reincorporating 100% of RAP in hot and warm mixes. The components and Accessories Award in this sector was given to EXO PUSH; an exoskeleton that assists the raker in manual asphalt levelling operations - the first “wearbot” to emerge in the public works field. Lifting, Handling & Transportation - The Equipment and Machinery Award was given to Hinowa S.p.A. for the Lightlift 33.17 performance IIIS tracked aerial platform, with the Components and Accessories Award going to the Manitou Group for its machine stabilisation recognition system. Building & Concrete Sector – The Equipment and Machinery Award was presented to Alphi for its MaxUpDown which assists with the handling of MaxiDalle formwork panels. The Components and Accessories Award went to 360SmartConnect which connects concrete by transforming concrete into an interface with data and services associated with the structure.